This is the sixth article in a series about attending Culinary School. Also check out posts on Menu Planning, Cooking in Quantity, Poultry Class, Wine Tasting Class, and the Introduction to the series. Since moving to Fargo, I’ve asked several foodies where I can buy good seafood and each responded with something like a nose wrinkle or a shrug. It’s easy to find well-prepared seafood at restaurants in North Dakota, but it’s harder to purchase seafood for home cooking. Unlike the Twin Cities, we don’t have shops that receive seafood flown in, daily. One of my culinary instructors told me that most of the area’s grocery stores get all their seafood from the same supplier frozen, and then defrost it. He recommended that I ask grocers when their seafood is delivered and shop accordingly; I miss the days when I used to pop into Minneapolis’s Coastal Seafoods on a whim. Last winter, here in Fargo, I bought a questionable piece of fish that stunk up our residence for weeks and put my home cooking experiments involving fish on hold. Until now, that is. The second half of our spring semester brings us into the seafood unit of our Poultry and Seafood class at culinary school. Hands-on learning remains the heart of our culinary program and this unit is no exception. We’re still assigned typical bookwork and have to take tests to learn seafood basics, but we also spent two glorious afternoons in the kitchen where we found ourselves with an abundance of seafood. We learned how to prepare it and sampled to our heart’s content. I’ve always considered seafood special. When I was growing up, my mom hated fish so much that we weren’t allowed to cook it in the house. She choked on a fishbone when she was a child and had avoided fish ever since. She liked shrimp, but mussels, oysters, lobster, and crab never entered our kitchen. I remember one particular evening, we took my grandma to a Chinese buffet for her birthday. She had found steamed crab legs and struggled to crack them open. My parents requested a crab cracker, and they still struggled until they gave up, exasperated. My grandma sighed in defeat and announced she would never eat crab legs again. Decades later, I reflect on these memories and it’s no wonder I am left with a lingering fascination with seafood. I still feel giddy every time I get to eat it. Filleting salmonIn our seafood unit, we started with fish. Like poultry, fish are also divided into categories that sound like something from a Dr. Seuss book. Round fish, flat fish, fat fish, lean fish. Round fish, such as salmon and cod, are rounder in shape than flat fish, just as the name implies; they contain two fillets that come from each side. In contrast, flat fish have four fillets – two fillets come the top half of the fish and two come from the bottom. Flat fish’s eyes are also set on the same side of the body. 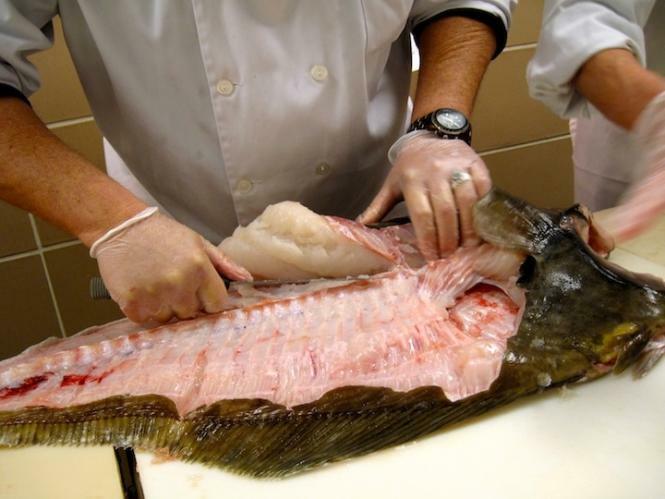 Halibut and sole are examples of flat fish. Cartilaginous fish differ from flat and round fish because they have cartilage instead of bones; a few examples are skates, rays, and sharks. In addition to shape, fish can be further broken down into fat and lean categories. Again, just like the name implies, fat fish are fattier, while lean fish are leaner. Both can mostly be cooked by the same methods, though lean fish require more care to preserve moistness. For example, both lean and fat fish can be cooked with wet-heat methods like poaching and pan-frying, but when it comes to dry heat methods like grilling, lean fish should be basted with fat. 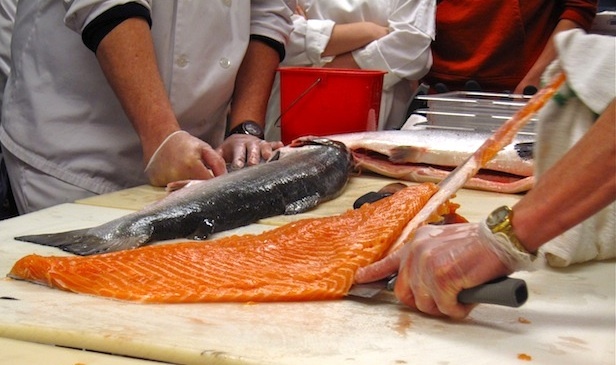 Examples of lean fish include cod and halibut; examples of fat fish include mackerel, tuna, and trout. One thing I found especially interesting is that farmed catfish are considered lean, while wild catfish are considered fatty. To cement this basic fish knowledge, we spent an afternoon in the kitchen gaining hands-on experience. 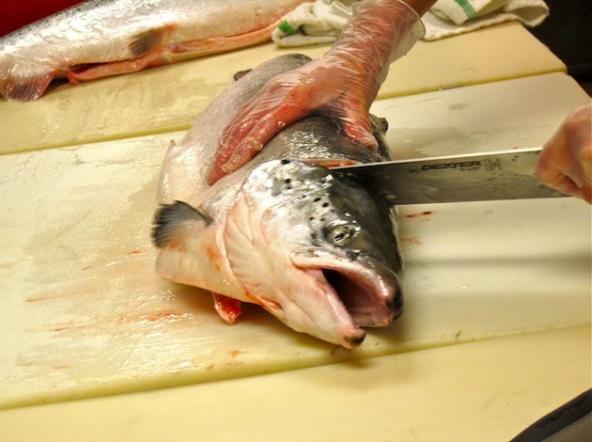 Our teachers ordered two whole salmon and a headless halibut that arrived fresh (never frozen). We practiced examining the quality of the fish by running through our checklist of freshness signs: the fish smelled oceanic but not unappealingly fishy, the gills were bright red instead of brown, the eyes were relatively clear and not too sunken, and the scales clung tightly to the skin. Lastly, we opened the fish bellies and checked for “belly burn”, visible decomposition that indicates the fish wasn’t gutted properly. Fish are gutted immediately after catching, even if they are frozen at sea, because the entrails cause the flesh to spoil rapidly. All three fish passed the freshness tests and we took turns scaling them with large spoons in the sink under running water, which is supposed to stop the scales from going airborne. Still, everyone who scaled ended up with tiny, iridescent speckles in their hair. Once the fish were scaled, our instructor walked us through the rest of the fabrication process. Volunteers took turns learning how to cut fillets from both the flat and round fishes, skin the fillets, and break them down into “sticks” that would be served for lunch. Sadly, these fillet sticks were immediately wrapped and frozen for another week’s lunch, but we were allowed to sample the fish while it was still fresh. 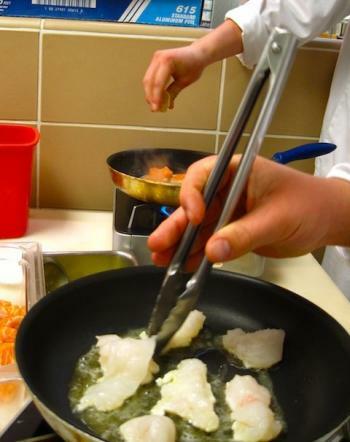 At a station with burners and sauté pans, we sautéed the scraps of fish that resulted from trimming perfect fillets. There were a lot of scraps, but I also suspect our teacher benevolently tossed a couple fillets into the mix. Those of us who stayed to help clean up continued to sneak pieces of fish and were invited to take some to go. I packed a few bites for my husband and ended up eating most of them before he even got home. Next, we moved from fish to mollusks, which mean “soft sea animals.” Bivalves, like oysters and mussels, have two shells; univalves, like snails and abalone, have one shell. Cephalopods, like octopus and squid, have no exterior shells; the name “cephalopod” means “head foot” because their tentacles are attached to their heads. Recently, I became fascinated with octopus when I saw that the species Octopus Vulgaris is the only invertebrates protected by the United Kingdom’s The Animal (Scientific Procedures) Act of 1986 due to its intelligence. I ran across the article Deep Intellect: Inside the Mind of the Octopus published by Orion Magazine in 2011 and it completely blew my mind. The giant octopi portrayed in this article seemed to enjoy interacting with humans, demonstrated advanced problem solving skills, and liked to play. I don’t mean to imply that we shouldn’t eat octopus, but I wanted to share the article because it changed my perception that cephalopods were just writhing sea blobs. It’s the most interesting piece I’ve read for years. This year we learned how to prepare scallops, mussels, clams, and oysters; in the past, the seafood unit has also included octopus. The shellfish was not served on the school’s menu so we got to have them to ourselves. We were taught to store shellfish in the coolest part of the refrigerator in their original, mesh packaging for up to seven days (though seven is probably stretching it). Alton Brown of Good Eats recommends storing mussels in a big container in the fridge, draped with a damp paper towel and topped with a bag of ice that you change daily. The most important guideline is to keep the shellfish alive, so don’t store them in freshwater or suffocate them in a tightly-closed vessel. Before I even tried shellfish, I read about mussels in Anthony Bourdain’s book Kitchen Confidential. He claims restaurants often improperly store mussels, which leads to severe food poisoning. He won’t order them if he doesn’t personally know how the chef stores them, but will pick out the best ones from a friend’s bowl. To prevent food poisoning, we learned that you have to not only store shellfish properly, but also examine them before cooking. We discarded the mussels that were already open and those with large chips that exposed the flesh. If they didn’t close when tapped, we threw them away since they were dead. Finally, we scrubbed their shells and removed any beards, a stringy appendage that helps them cling to objects. Next, our teacher cooked the mussels by tossing them in a hot pot with butter, minced garlic, white wine, and orzo. She covered the pot and steamed the mussels until they opened. Those that remained closed were tossed. 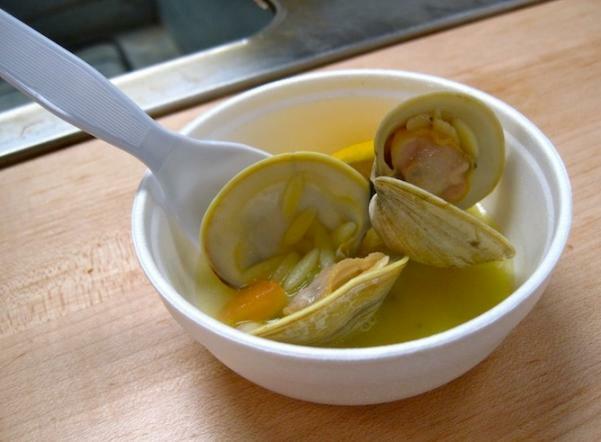 Then, we repeated the same process with the little neck clams. We learned that you can purge shellfish of grit by soaking them in a gallon of water mixed with 1/3 cup of salt for 30 minutes, draining, and repeating until they discard sand. We did not flush our bivalves before cooking and the mussels were clean, but the littleneck clams contained some grit. Mussels are less intimidating to prepare at home than they may seem. I’ve paid $13-$21 dollars for a bowl of mussels at restaurants, but they are surprisingly affordable if you buy them yourself. Our teacher offered to sell the extra bags of mussels, at cost, for about $3.50/pound, and I remember purchasing big, plump mussels from Coastal Seafood in the Twin Cities for around $5/pound. While our teacher showed us how to cook the mussels and clams, we snacked on sea scallops wrapped in bacon. They were purchased individually quick-frozen, and the extras were also offered for purchase at $14/pound. Their naturally sweet flavor reminds me of crab. I learned that sea scallops are sold in wet and dry forms, with dry the preferred type. Wet scallops are soaked in sodium tripolyphosphate, a preservative that whitens the flesh and adds weight, so you should look for dry scallops. OystersThe final part of Seafood class involved oysters. Many students had already left the kitchen because they wanted nothing to do with shellfish. Those who remained took turns shucking the oysters and serving them raw on the half shell with lemon wedges. Second-year students recollected finding tiny crabs in their oysters. These crabs are also known as pea crabs and survive inside the oyster by eating some if its food. Some consider them a delicacy and eat them raw or cooked along with the shellfish, but I’m pretty sure my classmates did not consider them a delicacy. You can see a photo of pea crabs on the blog Brooklyn Plated. These raw Blue Point oysters were as plump and briny as any good oyster I have tasted. I tried my first oyster eight years ago at a restaurant along River Street in Savannah, GA. They cost $.50 each and arrived on fancy metal trays with club crackers, hot sauce, lemon, and cocktail sauce. I liked them right away. This first taste answered my long-held curiosity about what seafood cooking show hosts and authors meant when they described seafood as tasting “like the ocean.” I never knew what this meant and wondered why it would be an appealing characteristic. 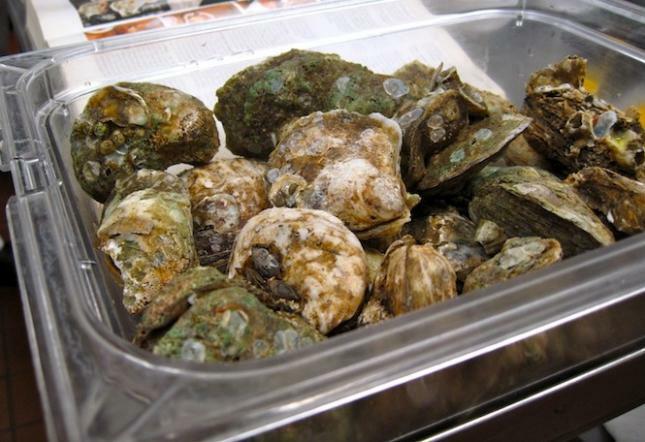 Try a raw oyster and its briny, oceanic flavor will answer these questions. By the time this article is published, class will be nearly over until next fall. We’ll spend one or two more days in the kitchen learning how to prepare shrimp, crab, and lobster. I accepted my teacher’s offer to purchase extra Mexican white shrimp along with a haul of extra scallops that weren’t used in class. However, I passed on buying live lobsters at $25 each because I just can’t bring myself to kill them. I’ll let someone else do the dirty work this time. 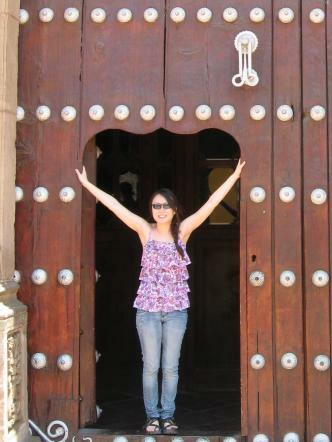 Maybe it will seem less intimidating the next time around.